After we touted the huge score at Belmont Park in the afternoon, it was hard to keep the momentum going last night. We did hit 3 winners out of the 10, but it could have been so much better. Which is exactly what we are intending to do today. So much better. 1st: 3-5-1-4…I guess someone has to win this one, despite the fact that there doesn’t appear to be one in the hunt right now. We will side with Bobby Lee (3) — the Dale Romans 2YO filly by Shanghai Bobby for a couple of reasons. We love the sire, and this one is dropping down from the MSW ranks into the MCL class for the first time. Despite the fact that she has not run well to date, the class relief should help and she gets a new hand on the reins. Kissin Kory (5) comes from the barn of my good friend, Buff Bradley. He normally takes his time and doesn’t crank them full tilt on the first go, but this one certainly could have a shot against these in here. Plus, the trainer owns part of this one. Never hurts to have some extra motivation. Yass Queen (1) is another first time starter, and the rail is winning at a near .20% rate this meet. Dam has 7 winners from 11 starters and 2 Stakes winners. Bloodlines are there. Watch out. I bet the 3 across the board and then box the top 3 in the exacta. 2nd: 2/6-3-4/5-8-7-1…I will key on my first “dot” play (Must Use for Me) of the day — Zena Rules (2). This one is converting from the turf over to the dirt for a trainer that hits with .17% of these surface switchers. But she gets a top rider in the saddle again, and he is super hot these days. Drops in class, and the barn scores with .10% of those returning to the races as a beaten favorite. Has hit the board in each of the last three tries — at much tougher level. Never been this low before. My solid choice here. I bet the 2 to win/place and then key over/under the 6-3-4. I will key the 2 over the rest of the numbers in a smaller version, as well. 3rd: 6-3-2/4-5-1…If the #8 does not draw in, and there appears to be no reason to believe that it does, then I will focus my betting strategy on the top 3 numbers in this group. Chase Greatness (6) will be getting his first start with the new trainer after having not shown much in the last two tries. But both of those were in against some tough foes in Stakes events up at Saratoga. Before that, this one beat Carter Cat — who is a really good one from the Steve Asmussen barn — to break the maiden here in the slop. Has the breeding to be a top grass runner. I really like the work here on Sept. 21, too. My top pick. Faraway Kitten (3) broke the maiden up at Woodbine and then tried an ambitious one in the KY Downs Juvenile Turf Stakes on Sept. 8. Had to jump over a fallen one in that debacle of a race, and that eliminated any late move. Should be better in this spot today, and the rider switch is to a super hot jockey. P H Factor (2) will be moving up to face winners for the first time, but the trainer does well when he switches from a sprint to a route (.30% winners) and is having a super year (.30% winners in 309 starts). Love the work at Arlington Park on Sept. 15, and the sire gets grass runners. Watch this one’s speed. I bet the 6 to win/place/show and then box the top 3 numbers in the exacta. I will key the 6 over/under the 3-2-4-5-1 in two more. 4th: 1-7/2-3-5…A really nice MSW event going two turns for the 3YOs, and I will key on the top two numbers here — led by Julius (1). This 3O son of Tapit — who cost $600,000 to buy as a Keeneland September Yearling in 2016 — has raced twice this year on the West Coast and under the tutelage of Bob Baffert. Has been switched East now and finds himself in the capable hands of trainer Brad Cox. The trainer is having another super year with .28% winners in 674 starts, and scores with .32% of those returning to the races as a beaten favorite. This one is working well for the barn debut and interesting choice of riders here. This guy normally doesn’t get many calls from the barn. Interesting. Hero’s Welcome (7) is a first time starter for Steve Asmussen, but comes to hand with some nice works. The owners just got West Coast back to the races yesterday, and may have another good one here. Hard to tell yet, but looks talented in the a.m. I bet the 1 to win/place and then box the 1-7 solidly in the exacta. I key the 1-7 over the 2-3-5 in a much smaller version. 5th: 5-4-1/3-6…I will focus the ole’ binoculars on the top 3 numbers here, as well. Gingermore (5) will get the drop down to the basement today after shipping in from Canterbury in Minnesota. Trainer has not very well here in the past, and especially with this rider. The only time they have teamed up in the last 60 days, it was a winning move for both. Florida-bred likes to stalk and move and could punch these out late. Honor Bar (4) will get the saddle today from a trainer who is a perfect 2-for-2 here this meet. This one drops to the basement for the first time, and the rider won the Jockey’s title here this past Spring. Should relish the softer company today, and love the bullet work on Sept. 16. A shot. Commercial Appeal (1) has race here three times and has a second and a third. Likes this place.I bet the 4 (take note) across the board, and then box the top 3 in the exacta. 6th: 4-2/6-7-3/1-5-9…Lodestar (4) is a first time starter for the Cox barn and has been working lights out. Any time you see a 4YO making the career debut this late, then the connections must figure that he has some talent and is worth keeping around. Like the connections here, and the owner/breeder know what they are doing. Barn hits with .22% of those debuting in the MCL ranks, and with .23% if first time starters overall. The dam is a Stakes winner, too. Adds up for me. Uncle Artie (2) is another making the first start today. Working well for a trainer who can get them ready off the bench. Hits with .19% first timers, but this one may like the grass better down the road. I bet the 4 to win/place/show and then box the top 2 numbers in the exacta. I will key the 4 over/under the 2-6-7-3 in two more, and then key the 4 over the 1-5-9, as well. 7th: 9-4-8/1-10-3/5-6-7…Kahramani (9) drops to the bottom of the claiming ranks today after being shipped up from Louisiana. Trainer is doing OK this year with .16% winners in 111 starts, and hits with .09% of those he ships. This one has a win over this track, though, and the work at the Churchill Training Center way back in July was solid. Was claimed out of a win here in June for nearly twice this level. Dangerous. Monday Confession (4) is the likely PT favorite, what with Corey Lanerie in the saddle. He does well for this barn, as mentioned earlier in the card. And, this Minnesota-bred has done well in open company before. Ran second here last October against much tougher. The definite one to beat. I bet the 9-4 both across the board and then box the top 3 numbers in the exacta. 8th: 8-6-1/10-4-7/2-5…The connections may dictate that we lean towards Captain Von Trapp (8) — who is a first timer for Steve Asmussen — and Ourbestfriend D L (6) — who gave Hog Creek Hustle a nice run for his money in his first start at Ellis Park back in August. 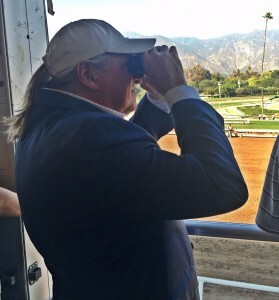 But…I’m going with Clipboard Money (1) — who is bred and owned by my great friend Mike Schnell. This one is training well in the a.m. and the dam has two winners from two starters. Rail can be tough for a first timer, but he gets a solid, experienced rider and if he can pop out of the gate and leave there on top, it is a nice spot to be in. Key is the start. I bet the 6-1 across the board and then box the top 3 numbers in the exacta. 10th: 8-4/5-7-1-10/9…I will go with Citali (8) in today’s finale. This one is dropping to the bottom of the claiming ranks for the very first time and does have 2 seconds and a third in 7 starts this year. Gets a huge rider switch, and love the work at Indy Grand on Sept. 12. If he can find that form? Goodbye. No Richie (4) didn’t take to the all-weather at Arlington Park last time out, but did have two wins in a row over the rock hard grass course at Ellis Park before that. Should relish the drop in class, and will be a tough out in this spot. I bet the 8-4 across the board and then box those two in the exacta. I will key the 8-4 over the 5-7-1-10.